Another summer month that started out with a fun, food adventure . Have you guys heard of Chuy’s Tex Mex? It’s a restaurant chain based in Austin that Illinois now has the privilege of hosting. A new location recently opened up in Warrenville and I got to visit for a tasting! You know that I will drive anywhere for good food, but a weeknight trip to the burbs always takes a special place. Well, it was every bit worth the drive and more! At the onset, I loved how everything is scratch-made at this restaurant. A feature uncommon for many chain restaurants. The vibe is enjoyable, and with every location known to have its own unique look, this one had a fun Elvis shrine and cute pictures of dogs and hanging fishies in the ceiling, creating an eclectic atmosphere. The drinks are absolutely phenomenal and creative, like the Texas Martini I had which was made to order and hand-shaken with jalapeno infused tequila and olives. Oh so good! The sauces are galore! Every imaginable sauce on the menu, was brought out on a sampler platter for me and my guest to try. The Tex-Mex with their famous red chile sauce being my favorite, and the Ranchero a close second. The food was outstanding and all classic Tex Mex fare came with its own twist. The Shrimp Fajitas were my favorite. What’s so special about them here you may ask? Well for one, the fajitas are marinated for 24 hours in their special spice blend of Shiner Bock beer, Serrano peppers and limejuice. And then served on a sizzling platter of grilled onions and peppers. The tortillas served with are handmade too. And the refried beans and rice on the side are as delicious as an entrée. The Southwestern Enchiladas we tried were out of this world. Several blue corn tortillas stacked with roasted vegetables (in our case) ,cheese, a delicious green chile sauce and topped with a fried egg. What a gourmet touch to the regular enchiladas I’m used to. The creativity didn’t stop there! The Shrimp & Cheese Chile Relleno was divine. And it was refreshing to see this dish incorporate seafood in it. A fresh Anaheim pepper fire-roasted and filled with shrimp, then battered and fried to perfection. Then drizzled beautifully with a sour cream to also tone down the spice from the pepper. This dish also such artistic plating, which is always pleasing to the eye. Onto dessert, which was their Tres Leches cake, which for me is quickly replacing anything chocolate. Drenched in a pool of crème fraiche, each bite overflowed with the three milks nicely sandwiched inbetween the sponge cake. The slice was humongous but I only say that positively. The food was so good that I secretly thanked Latin America for giving us this cuisine. The entire experience at Chuy’s was thoroughly enjoyable, and Warrenville suddenly doesn’t seem so far. If you want to brunch properly in Chicago, then you need to make a reservation at Roanoke; a posh tavern located in the heart of the loop. Although the menu covers most of your typical brunch fare, the execution of each dish is entirely outstanding. 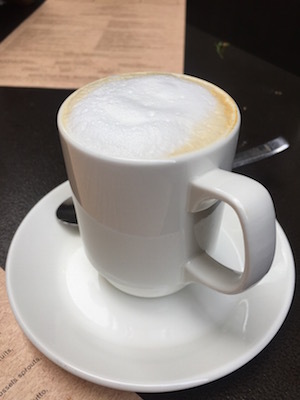 I got to visit recently with a guest, and enjoy a delicious brunch on their beautiful patio. The Blood Orange Mimosas were a nice change from the usual version, and the Solerno liquor offered very fresh and bright flavors. A variety of large plates sent out included, the Chilaquiles, Crab Toast, and Salmon Plate. You absolutely cannot leave this restaurant without trying the Chilaquiles, also my favorite from the tasting. Sunny side eggs (minus the pork), with Cotija cheese, cilantro, lime cream and avocado salsa, mixed in with fresh masa tortilla, made for a highly satisfying dish. Bold in flavor, the dish offered an almost smoky taste and stayed true to its more authentic Mexican version, in a dark red color. The intense flavor of chilies worked well with the blandness of the tortillas, and I could go on and on about this dish, but please go try it for yourself. The Griddled Jumbo Lump Crab Toast felt perfect after that spicy kick. If you love seafood in your brunch, then this is the dish for you. There was something rich yet light-feeling about this dish. The “Louis” remoulade on the sourdough along with avocado, hard-boiled eggs, capers, pickled onions and tomatoes were simply amazing. The crabmeat was tender and tasty, and the sauce clump–free just the way a remoulade should be. Eating this dish also made me realize how summer is the perfect season for crab! The Cured Salmon Plate came nicely laid out with Scottish Salmon on rye toast, hard boiled eggs, cream cheese, tomatoes, onions and capers. The ultimate brunch appetizer in my opinion, and a dish that really counts on the meat and produce being fresh, which it was here. This dish, did not disappoint! With our savory palettes completely appeased, we were ready to delve into the sweet section of the menu. I was almost speechless when I saw the Brown Butter French Toast and Hand Rolled Cinnamon Roll placed in front of us. The plating on both was so beautiful; I think I stared at it for a while. That is until I took my first bite. The lemon curd combined with the nutty flavor of the toast, and together dipped in the housemade blueberry maple syrup, took the decadence up many notches. The house baked cinnamon roll came with a brown butter cream cheese icingwith a vanilla aged in a whiskey barrel, and was also delicious. A sweet, golden brown buttery roll that is so addictive that I wish it came with fair warning. I was also happy to meet and chat with Chef Ryan, formerly at Seasons 52, about the restaurant’s vision. You’ll be pleased to know that Roanoke locally sources most of its produce. I’m still very impressed by the diversity of food offerings on their brunch menu, and everything from the food to the service far exceeded my expectations. Last week I got to switch it up with a tasting of modern Asian cuisine, and was entirely blown away! I visited a restaurant named MAK, which is located in Wicker Park and only about a year old. Built on owner Tommy Wang’s vision of serving quality Chinese food in the city, MAK was launched with the idea of offering Chinese food with a modern twist with a touch of mom’s cooking. I got to attend the tasting with a friend and we dined on their beautiful patio, which set the perfect scene for a nice, summer meal. Dinner commenced with a few mini bottles of their Cap-Ace Gekkeikan Sake, which was light, fruity and nicely fragrant. The Veggie Falafel for appetizer couldn’t have been a more perfect choice. Made with quinoa, chickpeas and edamame in their famous Wang sauce, it came on a bed of deliciously seasoned quinoa. This dish was a fun Asian touch to a Mediterranean classic and I instantly fell in love. The MAK Fried Rice was another hit for me from their starters section, and we ordered this one with shrimp. A nice-sized, steaming bowl of fried rice came out with marinated shrimp, once again in their famous MAK sauce. The rice was light, fluffy and wet like fried rice should be, with just the right amount of heat. For our Bowl, we ordered the General Mak Shrimp, which is their take on General Tsos, only better. The shrimp came tossed in a tangy glaze placed atop steaming white rice and with blistered green beans on the side. I wanted to spend the rest of my life eating that tender shrimp smothered in the most delicious chili sauce. Oh so good! A filling and fulfilling dish indeed! The MAK Tofu Veggie Bowl will blow your mind. It’s really a simple stir-fry but with flavors melding so beautifully with rich tastes of ginger, garlic and seasoned mixed veggies all infused in one tasty dish. As a reminder, any grain can be substituted for the quinoa too. The wraps looked too tempting to pass up, even though we were full. The portions are sumptuous and most dishes we tried could easily be shared by two. We tried the wrap with vegetables, which was simple and its taste enhanced by the MAK Hot Sauce served at each table. We did get the donuts too, but how could we not?! The Manager was kind enough to bring out an assortment of the Black Sesame and Five Spice donuts, which I scarfed down, then, and also for breakfast the next day. I was glad to see sesame being incorporated into a Western dessert, and also something other than chocolate, for a change. Both types of donuts were packed with sweet and salty flavors and had a light and delectable glaze on them. My tasting at MAK was such a pleasant surprise. I had walked in not knowing what to expect and can say with certainty that the entire experience knocked my socks off! Sometimes that’s the best way! I’m glad I got to celebrate National Sandwich Day this year at Hanna’s Bretzel. In honor of this delicious holiday, I attended a Social Sandwich Party at their River North location and enjoyed every minute of it. I’m anyways sold on their pretzel bread, baked fresh, daily, in-house. And at this event, I got to try all that bready goodness through an array of sandwiches from Truffled Goat Cheese to Hot Melties. Guests were treated to all their popular selections and we even left with some sandwich swag. Shouldn’t be a surprise that my favorite sandwich was the Wild Caught Atlantic Smoked Salmon with Dill Crème Fraiche. Need I even explain that one? It came with smoked sockeye salmon, MightyVine tomatoes, red onions, sliced cucumbers and housemade dill crème. What a delicious, pescetarian treat, both for the eyes and the mouth. The other sandwich I want to rave about was the Veggie Bomb (also vegan friendly) and here I loved the housemade Dijon it was drizzled with. The whole grain baguette was just as fresh and soft as the pretzel one. In addition, we tasted some of their yummy salads and desserts. 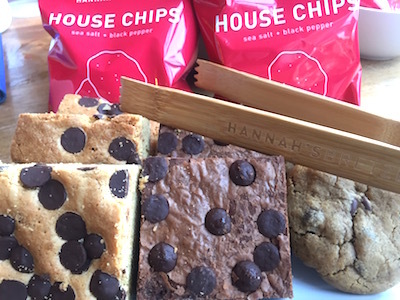 We scarfed through an array of brownies, blondies and cookies and scooped heaps of their Non-GMO Corn and Avocado salad, which was full of goodness. There was no dearth of food at this dinner. You can just tell that sandwiches are their thing and each one is made with lots of TLC! Can’t wait to go back! Hannah’s Bretzel has always been on my top lunch spots in the city for quick, casual food, but it may just have become a new dinner spot for me too! The same week I also toasted to some of the city’s finest restaurants at Chicago Magazine’s Best of Chicago 2017 event, with featured hors d’oeuvres and craft cocktails in tow! Held in the beautiful Artifact Events venue, this bustling event also had an open and live DJ. Attendees walked around and sampled foods and drinks being featured by several participating restaurants. My tour started with the highlight dish of the night from The Barn, a Hamachi crudo that was intensely delightful. The seafood offerings were strong the very next dish I tried was the Octopus Aguachile Tostada from Quiote which was again, divine! I shamelessly helped myself to several plates before stopping myself to explore other dishes. Rosebud outdid themselves with the Eggplant Salad with fresh mozzarella and a crispy, tasty eggplant cutlet. I’m craving it all over! Infinity was one of the sponsors and handed out cute boxes of truffles to guests, which I obviously couldn’t wait to bring home and try. The Dos Urban Cantina station was serving up cups of a tantalizing Seafood Ceviche which quite a kick. I washed my palette with Don Julio’s specialty cocktails and had a few of the Red Headed Stranger, which had fresh watermelon juice and agave in it. The food and drinks were flowing. Two of my favorite places Stan’s Donuts and the French Pastry School both had table and that too right next to each other. You bet I helped myself to severl donuts and croissants. I also splurged on a slice of deep-dish cheese pizza at the Lou Malnatis stand, and enjoyed every bite of it. Seriously I don’t think the event missed a single beat when it came to food and cocktails. Everything from the music to the ambiance was phenomenal. The event ran for three hours and my friend and I closed it down. How does one leave such a fun shindig! I’m already thinking about what next year’s event will bring! Indian food is my favorite cuisine, so I will never ever turn down an invite to a tasting at an Indian restaurant. But when it’s at one of my favorite Indian restaurants in the city, it’s all the more special. I went for a tasting with a guest recently at Indian Garden located in Streeterville, and it was glorious! The tasting began with all the comfort foods, like a platter of the Mix Veg Pakoras(vegetable fritters), and a beautiful presentation of the Chandini Chowk Aloo Tikki, comprising of split chik peas, mashed potatoes and garnished with a mixture of chilis, cilantro, onions and chutneys. This dish was delectable and wonderfully recreated the Indian street food experience. Definitely a trip down memory lane for me. The second course comprised of all the seafood goodness with platters of Chef’s Special Tandoori Lobster and Shrimp Tikka laid out in front of us. The lobster dish was one of the most innovative Indian seafood items I have seen and tasted. A gorgeous piece of lobster with subtle yet wonderful flavors of yogurt, ginger-garlic and cumin, chargrilled on the tandoor, was placed in a ‘makhani ‘ sauce and was unbelievably tasty. The marination on the Shrimp Tikka (drier version) was phenomenal also. I couldn’t believe just how tender the meat was and held all the smoky flavors together. This dish had some pizzaz! We moved on to the main course (served family style) of a Goan Fish Curry and Saag (delicately spiced creamed spinach), and ate it with sides of the Garlic Naan and Aloo Paratha. The breads were so fresh and made to order here. The fish curry was cooked in an aromatic sauce of Kashmiri pepper, cumin, garlic and saffron. Suffice to say, we wiped our plates clean! 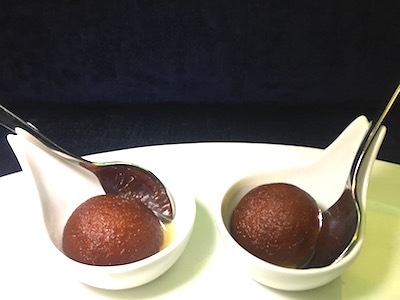 The zing was nicely softened with the Gulab Jamun and flavored Kulfis for dessert. Both were above par from Indian desserts I’ve had elsewhere. They were the right amount of sweet with generous tastes of cardamom that Indian desserts call for. The edible orchids were such an exotic touch! Even the Mango Lassi I had was done to perfection with the perfect amount of thickness. Fun Indian beers on the side too; Kingfisher of course will always be my favorite. Indian food is known for having a medley of flavors in each dish so the challenge is to not overcomplicate a dish. Indian Garden nails it. Every dish has been carefully crafted yet with no compromise to the taste and texture of the dish, and with no concession to creativity. Whether you’re a newbie to the cuisine or a connoisseur, a visit to Indian Garden is a must. Just be warned that you will be frequenting this place more often than you thought you would! And if you're feeling lazy, they will deliver right to your doorstep. Indian Garden is on most meal delivery services from GrubHub to Door Dash to UberEats. And good news, the restaurant is now catering to destination weddings not just in Chicago, but also globally. There is literally no excuse to check this place out!